Exceedingly rare being one of the only Flying Dragon Dollar patterns not to have been presented at auction in the last ten years. Very similar in appearance to the adopted design but featuring a much bushier full tail end. Incredibly well preserved with full envelope toning over each side belying its untouched state. One of only two examples to be given a proof designation, the finest certified example overall by a full two points and likely one of the finest extant. Deep royal blue hues are present along the rim on each side contrasted nicely with golden yellow and orange highlights around the devices. 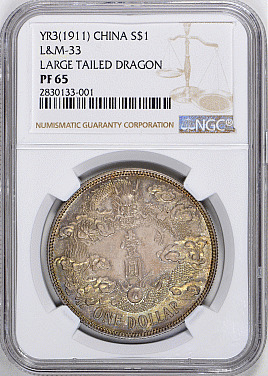 A fresh and unfettered example of one of the rarest late Qing pieces to come to the open market in quite some time. From the Cherrywood Collection.